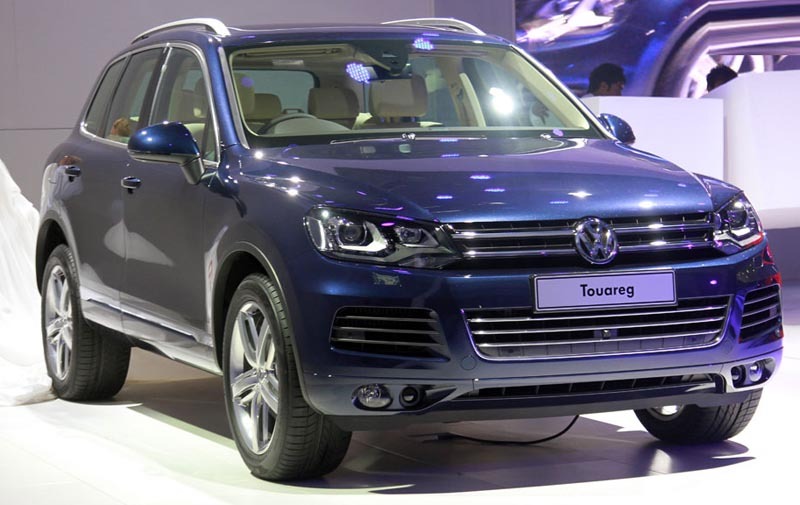 Luxury car maker Volkswagen will launch the New Touareg in India very soon, with a whopping price tag of around Rs.58.4 lakh (ex-showroom Maharashtra), company sources revealed. The New Touareg features is longer than its predecessor by 40mm, but it is also lighter by nearly 200kg than the existing model it is going to take place of. The new model boasts a 3.0-litre 6-cylinder diesel engine that is mated to an eight-speed automatic gearbox. The engine is capable of churning out a maximum power of 236bhp and a peak torque of 56.08kgm. In addition, it will come equipped with a dual-zone climate control system, Bluetooth audio system, a touch screen audio system which doubles up as a screen for the reverse camera, a panoramic sunroof, keyless entry & go, and switches in the boot to lower the rear suspension for easier loading. To provide more boot space, the manufacturer dropped the rear seats in the new vehicle. Automatic Bi-Xenon head lights with cornering lights come as standard, but the new vehicle doesn’t offer paddle-shifters for its 8-speed gearbox. The steering reach adjust is manual. The list of the new Touareg’s safety features includes airbags for driver as well as passengers, Electronic Stability Control. The all-wheel-drive new Touareg has five seats, unlike the BMW X5 that boasts seven seats. The test-drivers of the new Touareg showed that its potential buyers will enjoy impressively easy handling and driving experience.